Our clients often ask us references about hotels. Find below our recommendations and a review of the main neighbourhoods with an important hotel offering. We have chosen very few establishments in each section to facilitate your choice. 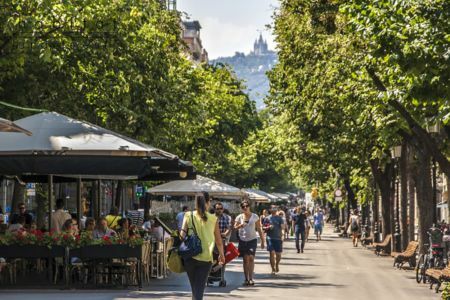 Barcelona being a very diverse city, choosing the neighbourhood is just as important as choosing the hotel itself. Even though we do get a commission if you book on our pages, our recommendations are reliable as these hotels are chosen according to the comments we get from our private tours clients: i.e. these are the hotels where we routinely pick-up clients from. Passeig de Gracia is the most elegant avenue of Barcelona: it is both the high-end luxury shopping street of Barcelona and a unique showcase of turn of 20th Century Art Nouveau architecture (including 2 houses by architect Antoni Gaudi). It's always a pleasure to take a stroll around the hotel, even at night as it must be Barcelona's better illuminated street. There are nice restaurants and cafés just around any corner catering to both the locals and the foreigners. 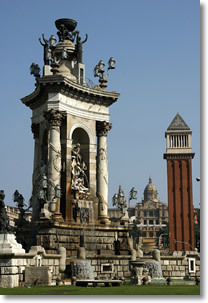 Not to be mistaken with the famous tourist "Rambla", Rambla de Catalunya is Barcelona second most elegant avenue. Although besides the name they also share the same layout: a wide central pedestrian alley with only one lane for vehicles on each side. Shaded by linden trees, it is very inviting just like the open air terraces cafés and restaurants. 5 Stars: Claris Hotel & Spa, El Palace, Majestic & Spa GL, Casa Fuster, Omm, Renaissance Barcelona, Monument, Alma, Mandarin Oriental, Cotton House, Almanac, The One Barcelona GL. 4 Stars: Alexandra, Avenida Palace, Condes de Barcelona, Gallery, Murmuri, NH Calderon, Regente. The whole area is a pedestrian-only "island" and some hotels there can be difficult to reach by car, but it is also the most pleasant part of town when on foot. 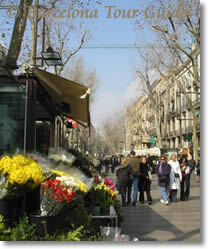 And it is within easy walking distance of both la Rambla and the trendier area of the Old Town known as Born. Gothic Quarter does not mean that all the buildings there are from the Gothic period: actually, they date back to plenty of time periods ranging from the 1st BC, when the city was founded, to the 21st century and often in the same building! 5 stars: Felip Neri, Mercer, Ohla, The Serras, Grand Hotel Central, The Wittmore. 3 stars: Banys Orientals, Suizo, Rec Contal. Most of the Old Town is a pedestrian-only area with serious restrictions of traffic, a point that has to be taken into account if you have mobility problems and need to be picked up right at the door of the hotel, or if you have a lot of luggage, etc. Via Laietana is the only wide avenue open to transit that crosses the entire Old Town connecting the Port (Port Vell marina) to the Eixample district. Hotels on Via Laietana: Ohla Hotel, Grand Hotel Central, H10 Montcada, Colón, Suizo, HCC Montblanc, Colonial. Only 2 drivable sreets cross the Old Down: La Rambla, in the center of the photo & Vía Laietana to its right. The philosophy being: walk through or drive around. Plaça Cataluny is he very heart of Barcelona in all regards: practical: it's a big hub for all types of public transport from commuter trains to the bus to the airport; symbolic: it hosts plenty of events: when the Barça wins an important game, supporters will gather there, on the patron saint festivies, there are concerts etc. 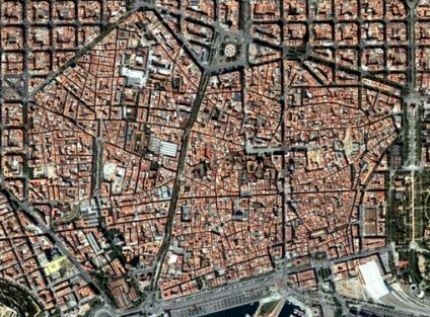 Catalunya square is also an articulation between the Old Town and the Eixample district developed after the 1850. At one corner you are at the touristy Rambla and at the opposite one, you have Passeig de Gràcia. The present day layout of the square dates to the 1920s, when it was the financial district of Barcelona. Most of the buildings lining the square were headquarters of bancks and other financial institutions. Do not miss the 40+ sculptures from the 20s... in their day they caused quite a scandal for exposing to much flesh! 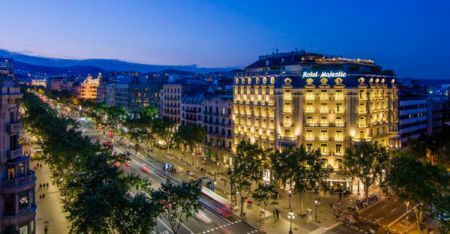 5 stars hotels: there are no 5 stars hotels (yet) on Plaça Catalunya itself, alhough several hotels listed in the Passeig de Gràcia / Rambla de Catalunya area are also close to Plaça Catalunya such as: El Palace, Cotton House, Mandarin Oriental Almanac and even Le Meridien. 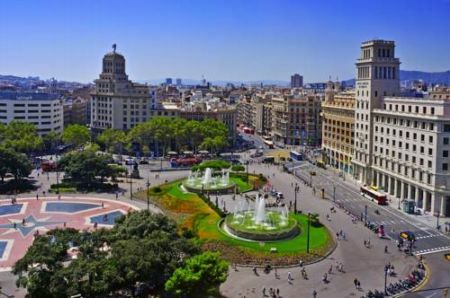 Located on one of Barcelona's main exit or entrance from the South -including the airport- Plaça d'Espanya is a huge traffic circle at one corner of the the planned Eixample district and on the edge of the former smalled town named "Sants". Though a little farther from the city center (Plaça Catalunya there are plenty of taxis and public transport options. This part of town has a large offering of hotels as it is close to "Fira Barcelona" one of the main trade fairs and convention grounds. On busy convention or trade fairs dates, prices can get quite high and availability quite low though you can get bargain prices off convention dates. Off from the heavy tourist scene of central Barcelona, the neighborhoods around Pl. d'Espanya will offer a more "local" feel. Plaça d'Espanya is within walking distance of the Magic Fountain sound and light show. There are no 5 stars hotels (yet) on Plaça d'Espanya. 4 Stars: Catalonia Plaza, Crowne Plaza Barcelona Fira Center, Vilamari. Sants is the neighborhood of Barcelona's main railway station. Its origins date back to the 10th c. when a small village on the edge of Barcelona evolved around a tiny church. 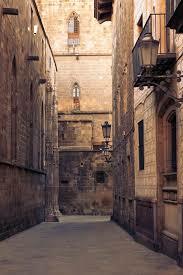 Throughout the Middle Ages, Sants flourished enjoying its closeness to Barcelona. Came the 19th century and the Industrial Revolution and Sants became an important industrial and working class residential area. The train station lobby is on the ground floor and the platforms are underground. The rest of the building is the Barcelo Sants hotel. 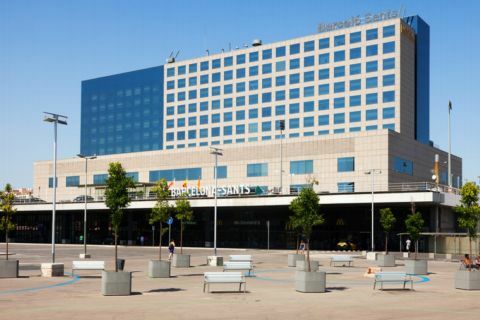 Hotels by Barcelona Sants AVE train station: Barceló Sants, Gran Hotel Torre de Catalunya, Expo, AC Sants Hotel. Until the 1992 games Barcelona lived with its back to the sea: the land by the sea was occupied by old industrial estates, there was a railway line running along the beach preventing access to it, etc. Now, Barcelona has 4.5 miles of beaches in whose center lie the "Port Olímpic and the Vila Olímpica. On the occasion of the Games, the area was renovated: apartment blocks were built to accommodate the athletes at the "Olympic Village". Other improvements included beaches, a long and wide beach side promenade, a new marina, a shopping mall a luxury hotel, etc. It eventually became one of the most demanded residential area in Barcelona. The whole area is also known for its abundant though diverse offering of restaurants and of beach clubs such as Pacha, the Catwalk or the Opium... And the Casino! Icaria Barcelona, H10 Marina Barcelona. It is the newest district in Barcelona, so new that parts of it are still under construction. Just like the Olympic Village, this former industrial area was developed on a special occasion: the Forum of Cultures in 2004. 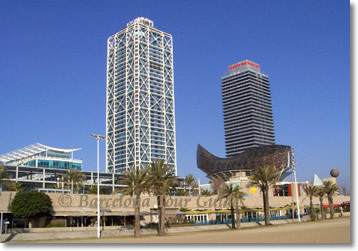 The core of that development is the International Convention Center of Barcelona, which hosts huge conventions. Hotels where first to appear: most are big and of course brand new business hotels. The drawback is the location: quite a long way from Central Barcelona and other spots of interest, although they are all very close to the beach.